What is a pillow alarm? 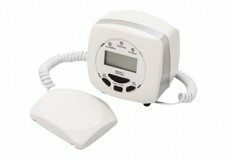 A pillow alarm is designed for use by the deaf or hard of hearing, it is a battery powered bedside alarm that alerts people to a fire alarm sounding through vibration and light. Part of the alarm is placed under a pillow, so that it will wake someone sleeping in the event of a fire. Geofire designs and manufactures a radio controlled pillow alarm called the Zleepsafe and is currently developing a new acoustic pillow alarm, which will be part of the Agrippa range of products. Our pillow alarms use a under pillow pad to create a vibration and bright LEDs in the the bedside unit to attract attention. The trigger for the unit activations is a fire alarm; the fire alarm will communicate differently depending on the mechanism you use. The built in alarm function can be used to alert a user when no fire alarm is present. Radio systems connect wirelessly to a controller via radio signals. This controller is mains powered and easily wired into the existing fire panel and therefore does not alter the building infrastructure. In the event of a fire, the controller is triggered into alarm mode by the fire panel and signals the pillow alarm into fire state. Please click here for a list of our approved installers. The radio systems are category A compliant, as defined by BS7273-4. Acoustic systems are a cost effective plug and play type solution, which listens for the fire alarm. Geofire’s acoustic solution, the Agrippa range, is the first of its kind on the market; it listens and learns your specific fire alarm and activates when it hears a particular sound. This differs from others on the market, activate on hearing any loud noise. This significantly reduces false activations. The Agrippa range can be fitted by anyone; it involves placing the unit on a bed stand, setting the time and putting the pad under the users pillow. Click here to view the fitting instructions.